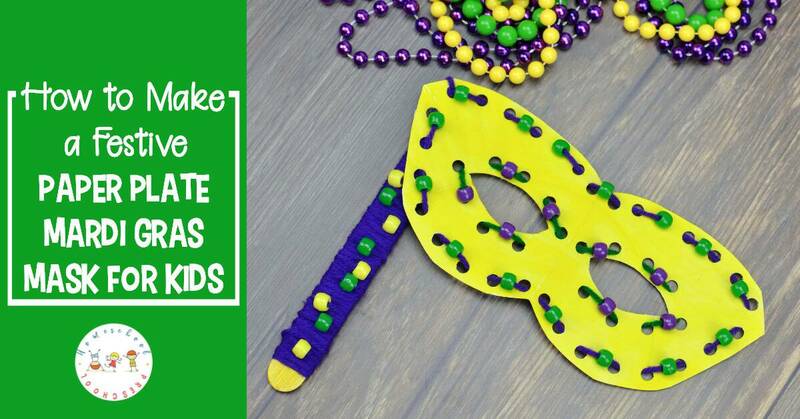 You don’t want to miss this festive Mardi Gras paper plate craft for kids! 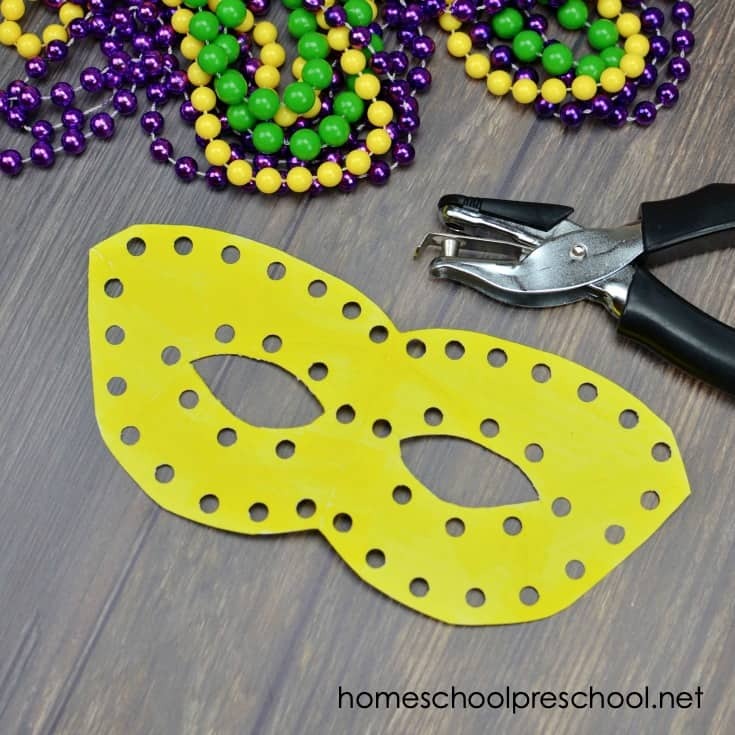 Come see how to turn a paper plate into a fun beaded Mardi Gras mask for kids to wear! 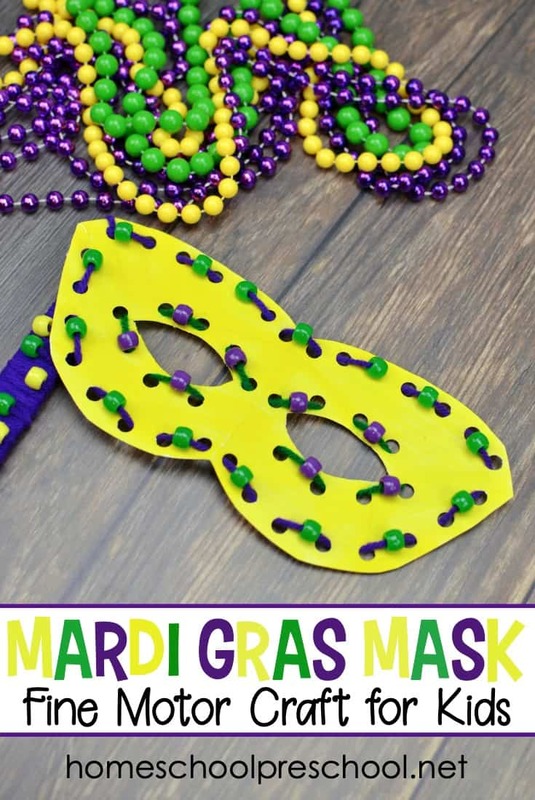 Your little crafters will have so much fun personalizing their very own Mardi Gras mask! 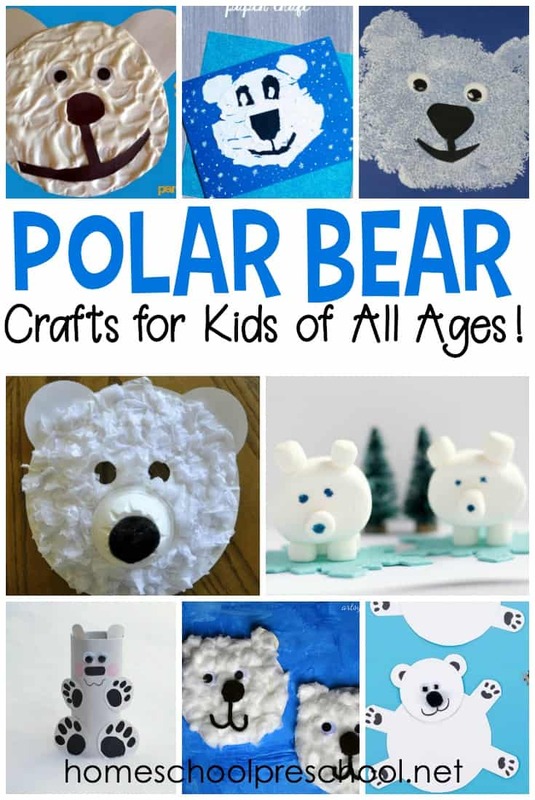 Paper plate crafts are fun and inexpensive. And, this mask is no exception. 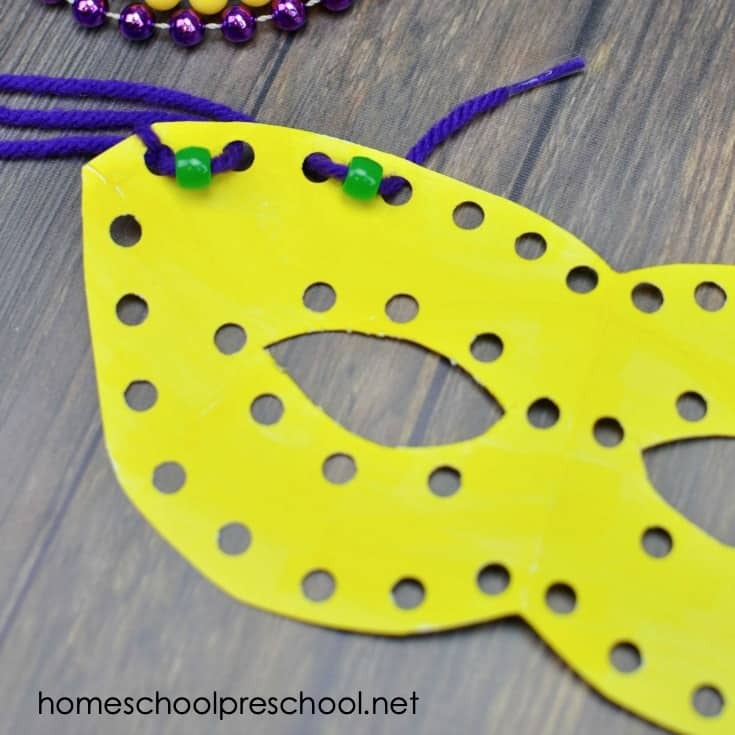 With some beads and string, your kids can decorate their mask to wear as you celebrate Mardi Gras. 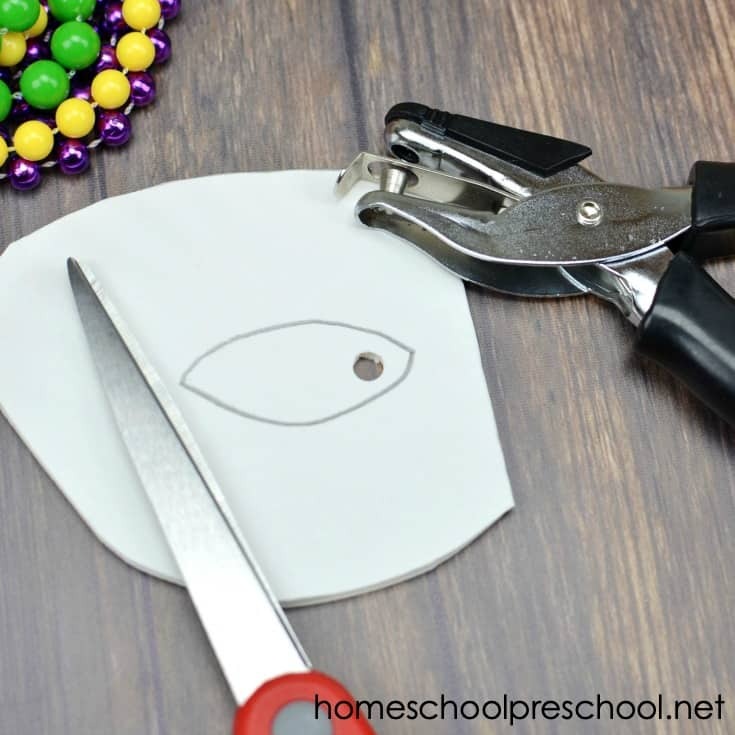 Your kids will be able to build fine motor muscles and work on hand eye coordination as they thread the beads and lace the yarn around the outside edge of this mask. So, it’s a skill building craft! The best kind, in my opinion. 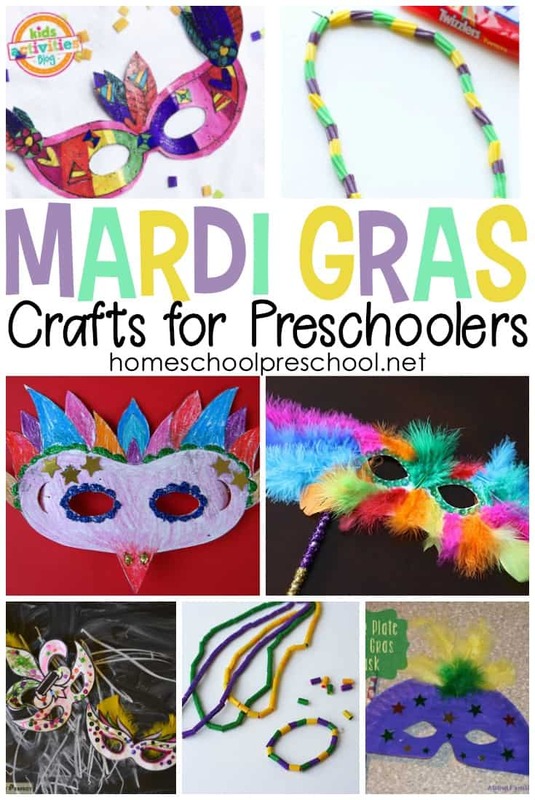 Your kids will love parading around the room with their Mardi Gras masks when they’re done. Put on some festive Creole music, and have a little dance party! Cut a paper plate in half. Then fold the plate in half and draw an eye hole. Shape the top and bottom to create a unique look of your own. Cut along the outside of the shape. Cut the eye hole out. It’ll be easier to cut the eye hole, if you make a hole with the hole punch. This will create a space for the scissors to fit inside. Color or paint the entire mask yellow. Create holes along the entire edge of the mask and eye area with the hole punch. 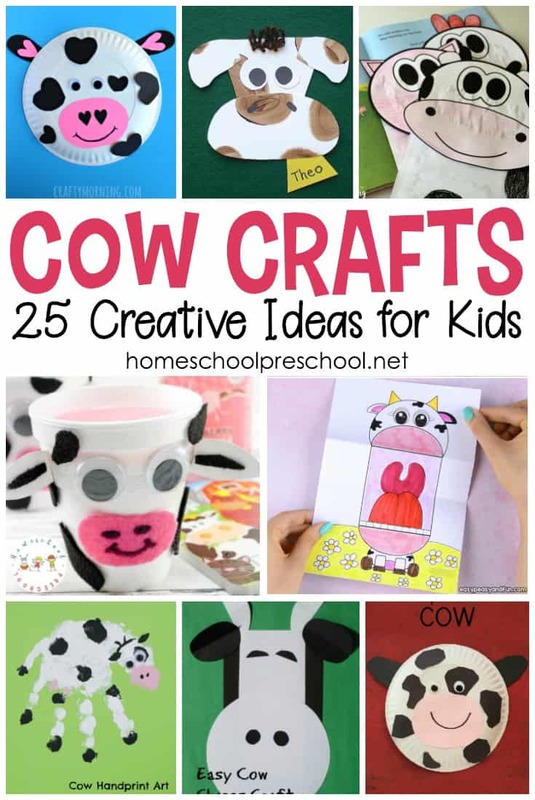 This is a great activity for little ones to do if they’re strong enough. Even if they only punch a few of the holes, they’ll be building hand muscles as they squeeze the hole punch. Starting at one outside edge of the mask, thread the purple yarn into a hole and tie a knot to secure it. Then lace the yarn through the next hole, adding a bead before going to the next one. Repeat around the whole mask. Secure the end with a knot. Use this technique with the eye holes using the green yarn and purple beads. Tie off the string on the back of the mask to secure the string and the beads. If your kids would like to make a stick to attach to their mask, you’ll need a large craft stick. Paint or color it yellow. Wrap purple yarn around the stick adding beads at random. Glue the stick to the side of the mask, and your craft is all ready to wear!